This recall involves the phil&teds® "explorer"TM and "hammerhead"TM Strollers. The recalled strollers have metal frames and were sold as single strollers or with a doubles kit to make them double strollers. 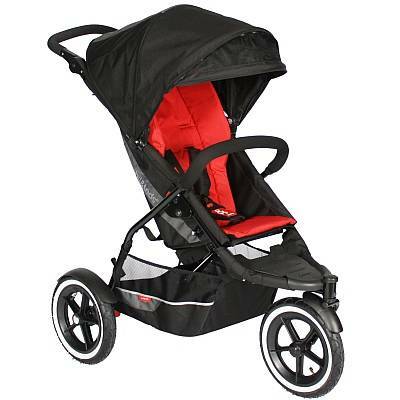 The "explorer"TM stroller is a 3 wheeled stroller with a black powder coated steel frame and a fabric seat, basket and canopy. The "hammerhead"TM stroller is a 4 wheeled stroller also with a black powder coated steel frame and fabric seat, basket and canopy. "Explorer"TM strollers were sold in a variety of colors, and the "hammerhead"TM strollers were sold in black only. Affected strollers were manufactured between June 2010 and January 2011. The serial numbers run consecutively with the month and year first, followed by the unit number. Affected serial numbers are: 0610/0001 to 0111/4788 (June 2010, unit #1, to January 2011, unit #4788). This information can be found on a sticker attached to the inside of the left hand hinge when viewing the stroller from behind. The "explorer"TM stroller will have a label affixed to the lower rear cross bar/axle bar which states "phil&teds® Model EX". The "hammerhead"TM stroller will have a label affixed to the lower rear cross bar/axle that states "phil&teds® Model HH". phil&teds® has received eight reports of incidents worldwide, however, no injuries have been reported. At time of the recall neither Health Canada nor phil&teds® has received reports of injuries related to the use of these strollers in Canada. You should immediately stop using the affected stroller and contact phil&teds® to arrange to receive an upgraded brake assembly. Regardless of any indication of damage you are advised to register with phil&teds® to receive a replacement frame and self install instructions free of charge. For additional information in the U.S. and Canada, contact phil&teds® USA toll free at 1-855-652-9019 between 9 a.m. and 5 p.m. MT Monday through Friday or visit the company's website. Approximately 1,900 "explorer"TM units and 65 "hammerhead"TM units of the recalled strollers were sold at specialty Juvenile goods outlets and online retailers across Canada. In the United States, approximately 7,400 "explorer"TM units and 160 "hammerhead"TM units of the recalled strollers were sold. These recalled products were sold from August 2009 to March 2011 in Canada and in the United States. The units were manufactured in China.The manufacturer is phil&teds® of New Zealand. The importer is phil&teds® USA Inc. of Fort Collins, Colorado. Good risk management with a focus on quality control should help prevent most claims. When a situation like this does occur then the cost of the product recall can be addressed through an insurance policy. If there is deemed to be a higher risk of injury, often seen with children's furniture, then you will likely see a higher than usual deductible for claims resulting from product injury.